In 2013, Siena Corporation set out to construct an “ezStorage” self-storage facility in Rockville, Maryland. The property on which it chose to build was located down the block from an elementary school. Parents at the school expressed fears that the storage facility would lead to safety concerns for the elementary-aged students, including an increase in traffic and “U-Haul-style trucks” driven by inexperienced drivers, the storage of illegal or hazardous materials, and the potential release of asbestos. In response to these concerns, the City Council proposed the Planning Commission adopt a new zoning amendment that prohibited self-storage facilities within 250 feet of public schools. The Planning Commission recommended that the amendment be denied and held a public hearing on the proposed amendment. While this was taking place, Siena obtained conditional site plan approval from the Planning Commission for their proposed “ezStorage” facility. However, this was conditional approval awaiting Siena’s full compliance with nineteen additional conditions as well as reviews by numerous local agencies. The Rockville City Council ultimately adopted the zoning amendment prohibiting self-storage facilities in February of 2015. Siena brought suit against the City Council, the Mayor and two Councilmembers who had supported the amendment, and a Rockville resident who had urged its adoption (collectively “the Council”) seeking judicial review of the adoption of the zoning amendment in State court. Siena alleged in its complaint that the amendment violated its due process and equal protection rights under the Fourteenth Amendment and that the newly adopted zoning amendment targeted them specifically. The Council removed the case to federal court and then moved to dismiss. The federal district court dismissed Siena’s federal due process claim, concluding that “Siena lacked a protected property interest in the ezStorage facility’s construction because it had not applied for a building permit.” Regarding Siena’s equal protection claim, the court held the zoning amendment had a rational basis and was thus constitutional. Siena appealed the district court’s decision to the Fourth Circuit, which reviewed the court’s decision de novo. To prevail on its claim that it was denied due process, Siena needed to show “(1) that it possessed a ‘cognizable property interest, rooted in state law,’ and (2) that the Council deprived it of property interest in a manner ‘so far beyond the outer limits of legitimate governmental action that no process could cure the deficiency.’” The Court found that Siena failed to meet either prong of the test. As to the first prong, Siena had not satisfied the conditions necessary to file for a building permit. But even if it had, the Court explained that zoning issues are local matters that should be decided at the local level. The Fourth Circuit noted that “[e]ven if Siena had a protected property interest here, the enactment of the zoning text amendment would fall short of a substantive due process violation.” Under its analyses of the second prong, the Court held that the action taken by the Council (the passing of an amendment barring self-storage businesses within 250 feet of public schools) was inside the limits of legitimate governmental action. The support for that conclusion was based on evidence that the Council heard testimony about the negative effects of self-storage sites and could have reasonably believed that testimony. The Fourth Circuit quickly disposed of Siena’s claim that the amendment violated the equal protection clause by pointing out that the action in question did not involve any rights protected by a higher level of scrutiny than rational basis. The Court stated that “the zoning text amendment is rationally related” to “the state interest in protecting schoolchildren.” Additionally, the Court noted that legislatures have great discretion in drafting statutes that involve economic matters, and this statute did not target Siena but rather applied equally to all self-storage businesses. This case reaffirms the deference given to local authorities in zoning matters. The Fourth Circuit is hesitant to intervene absent a fundamental right at stake or targeting language. The expanded use of horizontal drilling and hydraulic fracturing (“fracking”) has raised significant concerns about the environmental impacts of the process. Incidents of methane leaks, water contamination, and air pollution are among the most frequently-raised issues. But fracking has other potential impacts, as well—specifically, impacts on the character of local communities. As one scholar has noted, fracking is, from start to finish, an industrial process, with the same potentially disruptive effects that flow from other industrial land uses. “In many cases,” as another commenter notes, “communities are encountering large-scale industrial fossil fuel production for the first time, and as remote natural gas resources are exhausted, fracking continues to push closer to residential areas.” In several states, these circumstances have created tension between state laws regulating oil and gas exploration, on the one hand, and local land use ordinances seeking to restrict fracking-related activities, on the other. The policy debate concerns what level of government should regulate fracking; the legal debate concerns whether state fracking legislation preempts local land use authority. Courts considering the issue to date have tended to side with local governments, invalidating state-level attempts to wrest control over fracking from local communities. In the summer of 2014, North Carolina entered this debate when the General Assembly enacted fracking legislation that expressly preempts local ordinances prohibiting, or having the effect of prohibiting, oil and gas development. This Essay considers whether North Carolina’s preemption provision is likely to pass judicial scrutiny or suffer the fate of similar legislation in other states. After reviewing the reasoning employed by other courts, as well as the mechanics of the North Carolina preemption provision, my preliminary conclusion is that North Carolina’s fracking legislation will likely have more success when facing judicial scrutiny than similar legislation has received elsewhere. The legal tension between state and local power over fracking has been highlighted by recent litigation flowing out of the states that contain the Marcellus Shale formation, where fracking activities have been in full swing. Two decisions—one from the New York Court of Appeals and the other from the Pennsylvania Supreme Court—highlight the legal issues. Two New York municipalities enacted local zoning ordinances that prohibited oil and gas operations within their respective jurisdictions. Oil and gas lessees in both towns sued, arguing that the ordinances were preempted by a state statute, which provided that it “shall supersede all local laws or ordinances relating to the regulation of the oil, gas, and solution mining industries.” In a consolidated appeal, a majority of the New York Court of Appeals disagreed. Noting that New York is a home rule state, and that zoning is one of the “core powers of local governance,” the majority stated that it would find preemption only where there was clear legislative intent to specifically preempt local land use authority. The majority then reviewed the language of the state statute, as well as the overall statutory scheme and legislative history, and concluded that no such intent existed. The statutory language preempting local laws “relating to the regulation of the oil, gas, and solution mining industries,” did not include these zoning laws, which were “[p]lainly . . . directed at regulating land use generally [rather than] the details, procedures or operations of the oil and gas industries.” In short, because the land use ordinances did not directly regulate oil and gas operations, they were not preempted, despite their indirect effect on such operations. In a case that spawned four separate opinions covering more than 100 pages in the Reporter, a divided Pennsylvania Supreme Court held that local autonomy trumped a state statute regulating oil and gas development. Among other things, the statute at issue (known as “Act 13”) amended the state’s oil and gas laws to: (1) provide for a single, statewide zoning regime for oil and gas development activities; and (2) preempt local ordinances purporting to regulate oil and gas operations in a manner different than that established by the statewide scheme. Several municipalities and municipal officials filed suit to challenge Act 13 on the grounds that it violated several provisions of the Pennsylvania and United States Constitutions. In the state supreme court, a three-member plurality viewed Act 13 as violating article I, section 27 of the Pennsylvania Constitution. That provision—the so-called “Environmental Rights Amendment”—bestows “a right to clean air, pure water, and to the preservation of the natural scenic, historic and esthetic values of the environment” and says that “the Commonwealth shall conserve and maintain [the state’s natural resources] for the benefit of all people.” According to the plurality, this provision of the state constitution obliges each branch of government—at both the state and local levels—to consider in advance the environmental effect of any proposed action it might take. Moreover, because local governments are obligated in the same manner as the state, the state legislature had no power to take from them the necessary means by which they might fulfill that obligation (here, the power to regulate land uses). 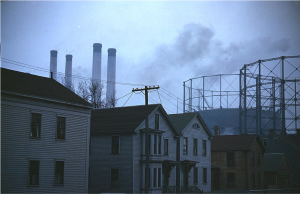 Finally, the plurality concluded that the protection of environmental values was a quintessentially local issue “that must be tailored to local conditions.” For all of these reasons, Act 13’s uniform, statewide zoning regime was held unconstitutional. The experience of litigation in the Marcellus Shale demonstrates that state statutes purporting to preempt local land use regulations have not been met with judicial favor. Because North Carolina’s recent fracking statute contains a preemption provision, the question is whether this judicial disfavor will repeat itself and threaten the scheme worked out by the state’s General Assembly to balance the tension between state and local legislation. To help answer this question, the following is a discussion of the North Carolina preemption provision and a brief analysis of how North Carolina’s law differs from that in New York and Pennsylvania. (1) That there is a local ordinance that would prohibit or have the effect of prohibiting oil and gas exploration, development, and production activities, or the use of horizontal drilling or hydraulic fracturing for that purpose. (2) That all legally required State and federal permits or approvals have been satisfied and that the permits or approvals have been denied or withheld only because of the local ordinance. (3) That local citizens and elected officials have had adequate opportunity to participate in the permitting process. (4) That the oil and gas exploration, development, and production activities, and use of horizontal drilling or hydraulic fracturing for that purpose, will not pose an unreasonable health or environmental risk to the surrounding locality and the operator has taken or consented to take reasonable measures to avoid or manage foreseeable risks . . . . Although nothing is certain, there are several reasons to think that the preemption provision of the North Carolina fracking statute will have more judicial success than those in New York and Pennsylvania. First, whereas New York is a home rule jurisdiction, North Carolina is not. Technically, municipalities in North Carolina “can exercise only that power which the legislature has conferred upon them.” Although the General Assembly has indicated that powers granted to local governments should be construed broadly, the courts have not always followed this directive. According to a recent decision of the North Carolina Court of Appeals, local powers are to be construed broadly only where there is an ambiguity in the authorizing statute; otherwise, the plain meaning of the statute “must be enforced as written.” Additionally, the courts have held that local power is necessarily limited when exercised in a manner that is inconsistent with state law. Such an inconsistency exists when the local ordinance purports to regulate a subject that municipalities are expressly forbidden to regulate by state statute, or purports to regulate a field for which the state statute demonstrates an intent to provide a uniform scheme. Because the fracking statute expresses an intent to create a uniform system relating to oil and gas operations, as well as expressly invalidates local ordinances preempted by the Mining and Energy Commission, it probably would be deemed sufficient to overcome any local zoning authority that otherwise might exist. Accordingly, the reasoning employed by the New York court in Wallach—which relied heavily on local home rule authority and past precedent indicating that attempts to overcome such authority should be construed narrowly—is unlikely to find much traction given North Carolina’s differing laws on local power. The reasoning of the Pennsylvania court in Robinson Township seems unlikely to fare much better. Although the North Carolina Constitution contains a provision relating to natural resources, it is nowhere near as robust as the language contained in the Pennsylvania Constitution. The North Carolina provision states that “it shall be a proper function of the State . . . and its political subdivisions . . . to control and limit the pollution of our air and water . . . .” Although this language might possibly be used to impose an obligation similar to that in Robinson Township, the North Carolina language (i.e., “proper function”) is much weaker in this regard than that of the Pennsylvania Constitution (i.e., “shall conserve and maintain”). Moreover, research has revealed no North Carolina judicial decision interpreting the provision that broadly. Finally, unlike the statewide zoning regime in Robinson Township, the North Carolina fracking legislation—which seeks to preserve generally applicable zoning ordinances and allows preemption only if the fracking operations do not pose unreasonable risks to the locality—leaves plenty of room for local considerations and local tailoring. One of the predominant legal issues with the recent spate of fracking in the United States is whether state statutes pertaining to fracking operations preempt local ordinances relating to land use. While the case law demonstrates some judicial disfavor with the preemption argument, the North Carolina fracking legislation (along with North Carolina local government and constitutional law) differs substantially from that of other states where the issue has been tested. Although there are no certainties, a preliminary review suggests that the preemption provision of North Carolina’s fracking statute will fare better than those challenged in other jurisdictions. * Associate Professor of Law, Campbell University School of Law.
. See Jason Schumacher & Jennifer Morrissey, The Legal Landscape of “Fracking”: The Oil and Gas Industry’s Game-Changing Technique Is Its Biggest Hurdle, 17 Tex. Rev. L. & Pol. 239, 243–51 (2013) (discussing potential water and air quality issues).
. David B. Spence, Federalism, Regulatory Lags, and the Political Economy of Energy Production, 161 U. Pa. L. Rev. 431, 480–81 (2013) (noting aesthetic, noise, and social issues in addition to air and water quality).
. Rachel A. Kitze, Note, Moving Past Preemption: Enhancing the Power of Local Governments Over Hydraulic Fracturing, 98 Minn. L. Rev. 385, 389–90 (2013).
. See generally Act of June 4, 2014, 2014 N.C. Sess. Law 2014-4 (providing for development of oil and gas exploration) (effective, with some exceptions, June 4, 2014).
. Schumacher & Morrissey, supra note 1, at 303.
. 23 N.Y.3d 728 (N.Y. 2014).
. See id. at 739.
. See N.Y. Envtl. Conserv. Law § 23-0303(2) (McKinney 2014).
. Wallach, 23 N.Y.3d at 739.
. 83 A.3d 901 (Pa. 2013).
. See 58 Pa. Cons. Stat. § 3304.
. See id. §§ 3302–3303.
. Robinson Twp., 83 A.3d at 915–16.
. Pa. Const. art. I, § 27.
. Robinson Twp., 83 A.3d at 952.
. Id. at 978, 981–82. A fourth member of the court concurred in the result, but on different grounds. Specifically, the concurrence found that Act 13 violated substantive due process by imposing zoning standards that bore no rational basis to local realities. See id. at 1000–09 (Baer, J., concurring).
. N.C. Gen. Stat. § 113-415.1(a) (2014).
. Id. The Commission’s decision is reviewable under the state Administrative Procedure Act upon the filing of a petition within thirty days of the date of the decision. See id. § 113-415.1(h).
. Bowers v. City of High Point, 451 S.E.2d 284, 287 (N.C. 1994).
. See N.C. Gen. Stat. § 160A-4 (2000).
. King v. Town of Chapel Hill, 743 S.E.2d 666, 672 (N.C. Ct. App. 2013), aff’d in part, rev’d in part on other grounds, 758 S.E.2d 364 (N.C. 2014).
. See, e.g., Craig v. Cnty. of Chatham, 565 S.E.2d 172, 175 (N.C. 2002).
. N.C. Gen. Stat. §§ 160A-174(b)(4)–(5) (2000).
. See generally Wallach v. Town of Dryden, 16 N.E.2d 1188 (N.Y. 2014).
. N.C. Const. art. XIV, § 5.
. N.C. Gen. Stat. §§ 113-415.1(a), (f) (2014). PDF version of North Carolina’s “Fracking” Legislation by Michael B. Kent, Jr.